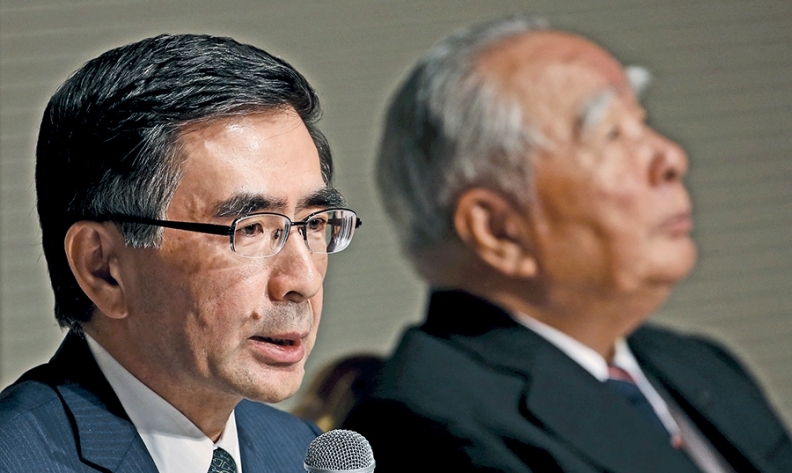 Toshihiro Suzuki, left, Suzuki Motor Corp.'s new president, will handle day-to-day operations while his father, Osamu Suzuki, will remain CEO and chairman and will set strategy and handle external affairs. TOKYO -- The next Suzuki to run Suzuki Motor Corp. differs in big ways from the Suzuki who has run it for nearly four decades. Toshihiro Suzuki, the elder son of the carmaker's long-serving patriarch CEO and chairman, shares his father's distinctive bushy eyebrows. But otherwise, he is a wallflower in comparison to his vivacious 85-year-old father. And he plainly says he has no designs on sitting as long in the automaker's driver's seat. 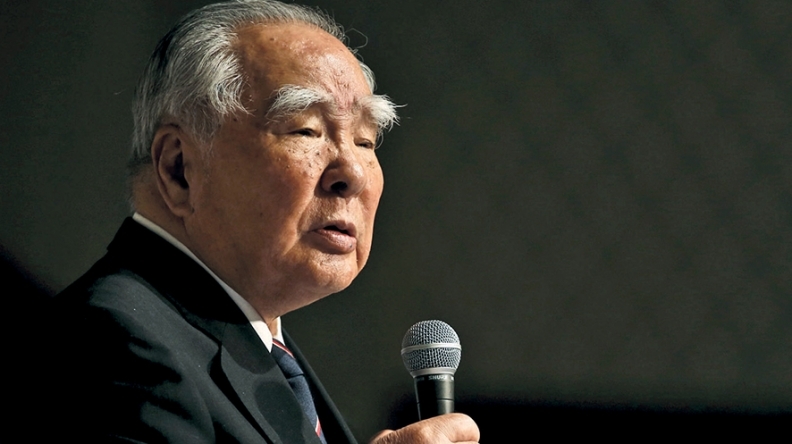 Indeed, the company he took charge of after being appointed president by his father faces markedly different challenges than those it faced when Osamu Suzuki took the reins in 1978. Changing times need a changing of the guard, and Japan's No. 4 carmaker is preparing for a new era. "Judging from the scale of Suzuki, it can no longer have a one-man or dictatorial system," Osamu Suzuki told reporters at a news conference that finally addressed mounting uncertainty about the company's succession plan. Osamu Suzuki will remain CEO and chairman setting strategy and handling external affairs, including its estranged alliance with Volks-wagen AG. Toshihiro Suzuki, as president, will execute the plans and handle day-to-day operations. "Judging from the scale of Suzuki, it can no longer have a one-man or dictatorial system." The senior Suzuki presided over nothing less than the wholesale metamorphosis of his company from a purveyor of motorcycles and cheap low-end niche vehicles into a global automotive empire. When Osamu Suzuki was appointed president in 1978, the carmaker had two assembly plants. By 2015, it had 15. Its work force ballooned from 8,820 employees to 57,400. And Suzuki's global output skyrocketed from 248,000 vehicles a year to more than 3 million, with its cars being sold in 201 countries. Much of that increase was the result of a shrewd deal in India. Suzuki Motor entered India in 1982 by teaming with government-controlled manufacturer Maruti Udyog. Years later, other automakers would flock to the Indian market, only to find Suzuki well entrenched as the undisputed leader. In 2014, Maruti Suzuki India Ltd. claimed 45 percent of the market, which by then had transformed from automotive afterthought into one of the world's fastest growing auto companies. Osamu Suzuki's successor, by contrast, can't expect such explosive growth. Rather, Toshihiro Suzuki will have to defend the carmaker's dominant market position in India and other emerging markets. He will also have to mop up the broken alliance with Volkswagen AG, which Suzuki has been trying to dissolve for four years. And the next leader must find new ways to finance next-generation drivetrain technologies necessitated by increasingly stringent emissions standards, possibly by striking up new partnerships for help. Toshihiro Suzuki, 56, was one of four executive vice presidents appointed in 2011 to run the daily operations, after two previous heirs apparent dropped from the scene: one retiring, the other dying. Prior to being tapped as president, Toshihiro Suzuki's public persona was one of quietude. He typically would share the stage in silent deference to his outspoken father, only breaking form to share a smile at one of the boss's trademark folksy witticisms. He is a yoga aficionado who doesn't touch alcohol, according to Japan's Nihon Keizai business daily. And until he joined the family business, Toshihiro Suzuki had a distant relationship with his father, the paper said. He is guarded in expressing his opinion. Toshihiro Suzuki spent two years, from 2001, in the U.S. in a liaison post with General Motors, which at the time owned 20 percent of Suzuki Motor. That alliance eventually dissolved, with GM selling its last holdings in Suzuki Motor in 2008 in a mad scramble for cash on the eve of the U.S. automaker's 2009 bankruptcy. But for a period, the two companies' jointly owned CAMI plant in Ingersoll, Ontario, was crucial in training GM production managers in lean manufacturing. Osamu Suzuki had hoped to name a new president after settling the Volkswagen partnership dispute, which has simmered in arbitration since 2011. In Detroit, Toshihiro Suzuki helped manage technology exchanges between the two companies, such as those for a fuel cell vehicle that was to be jointly developed by GM and Suzuki Motor. Before Detroit, he headed Suzuki's Iwata plant in Shizuoka Prefecture, west of Tokyo. Earlier, he helped manage production of mini and compact cars at its Kosai plant, also in Shizuoka. But the new president said he is not in it for the long haul. "To have one president for 30 years is no good," Toshihiro Suzuki told reporters. "I will aggressively grow human resources to pass the baton to a young successor as soon as possible." At last week's press conference, Osamu Suzuki said he had hoped to appoint a new president after settling the VW partnership dispute, which has been simmering in arbitration since 2011. The two companies entered arbitration to resolve Suzuki's request that VW give up its 19.9 percent stake. Suzuki said last month that the arbitration proceedings had finished and that both sides are awaiting a ruling. "I wanted to wait until the arbitration with VW had finished, but it is taking so long," Osamu Suzuki told reporters. "So I decided not to wait and announced the management change."